Rebekah Fuller from Lincoln Agritech presented at the first 2019 Speaker’s Science Forum held in the Banquet Hall at the Beehive on Wednesday 13 March. The topic of the forum was Mātauranga Māori. Lincoln Agritech hosted senior officials from the Chinese National Agro-Technical Extension and Service Centre (NATESC), a division of the Chinese Ministry of Agriculture and Rural Affairs (MARA), renewing an agreement first signed over two years ago. IRANZ CEOs met at the Malaghan Institute for their quarterly meeting. 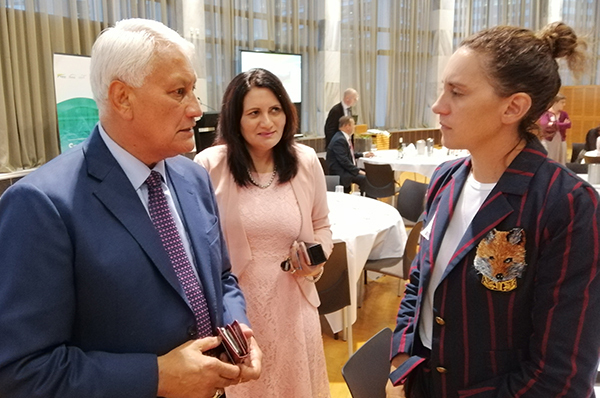 Dr Rebekah Fuller from Lincoln Agritech, right, discusses Mātauranga Māori with MPs Mr Nuk Korako and Dr Parmjeet Parmar. Photo: Rob Whitney. New Zealand has struggled to deliver new builds that are accessible to all ages and abilities. Now, a Building Better Homes, Towns and Cities research project is looking at ways to deliver affordable functional housing, particularly for older people. The Building solutions for affordable, functional housing in ageing and changing communities project is a collaboration between CRESA, Massey University, Public Policy and Research, and BRANZ. The team expects to deliver their first research findings by late 2019. Current European regional policy promotes "smart specialisation" by encouraging regions to expand into activities that "build on local strengths". Smart specialisation rests upon the idea that bringing together people with complementary skills helps them generate new ideas that boost innovation and growth. But does this actually work? In a study funded by the Building Better Homes, Towns and Cities National Science Challenge, Benjamin Davies and Dr David Maré, both of Motu Economic and Public Policy Research, analyse the potential for this way of generating ideas to promote urban employment growth in New Zealand. They find that, in New Zealand, the presence of related industries in an area is not a strong predictor of local employment growth. Local job networks promote growth in big cities, but not in small towns. Wellington docks: Photo by James Coleman. Following its commitment to improving medical practice through developing and implementing evidence-based management guidelines, the Medical Research Institute of New Zealand has played a senior role in the drafting of the Asthma & Respiratory Foundation (New Zealand) Adult asthma guidelines: A quick reference guide. The guidelines are designed to aid health professionals in delivering asthma care in the community, providing simple evidence-based recommendations for the diagnosis, assessment, and treatment of asthma in adults. The intended users are health professionals responsible for delivering asthma care in the community and hospital settings, and those responsible for the training of such health professionals. MRINZ Director Professor Richard Beasley says many of the key recommendations are based on landmark research undertaken at the MRINZ that has led to improvements in the management of asthma worldwide. Prior to this initiative New Zealand asthma guidelines had not been updated since 2002. MRINZ Director Professor Richard Beasley presents the new adult asthma guidelines in a video podcast. Cancer Immunotherapy - Cancer cell biology programme leader Professor Mike Berridge talks to Lynn Freeman about cancer immunotherapy and the science behind mitochondria and its important role in cancer and human disease. Understanding the allergy epidemic - Allergic responses expert and immune cell biology programme leader Professor Franca Ronchese lends her opinion and understanding on why so many Kiwis struggle daily with allergies, and why we're in the midst of a global rise of allergic diseases. Vaccinating asthma - Malaghan Institute director and asthma, allergy and parasitic disease programme leader Professor Graham Le Gros has been on the hunt for a cure for asthma for many years. Using parasites like human hookworm to understand the inner mechanisms of the immune response might be our best chance in finding a cure. Microbiology and immunology - Translational immunology programme leader Dr Olivier Gasser rounds off the RNZ Summer Times series with Lynn Freeman, talking about the vast role our gut bacteria play in human health and immunology. In particular, Dr Gasser and his team are looking at how our nutrition and gut affect influence our immune responses and consequently our health and well being. There are many different branches of research into understanding the immune system and human disease. Photo: Malaghan Institute. The Otago Daily Times reports on research work at Lincoln Agritech to deconstruct coarse wool fibre to create new materials. Described as a "major breakthrough", coarse wool — which comprises about 75% of New Zealand's wool clip — is broken down into its cellular components, creating new materials that are not wool but contain wool attributes. Potential uses for the novel materials include cosmetics, filters, and luxury clothing. This research programme is being co-funded by Ministry of Business, Innovation and Employment (MBIE) and Wool Research Organisation of New Zealand (WRONZ). In February, 25 school leavers joined WSP Opus as cadets through a regional scheme that channels emerging talent into engineering careers. The new recruits will work on transformational infrastructure projects that will reshape and benefit their communities. “There has been a long-term shortage of skills in the construction and engineering sector globally and locally – and the list of sectors affected continues to grow. At the same time New Zealand is investing in more infrastructure than ever before – as well as needing to effectively maintain our existing and ageing assets,” says Scott. New research from Motu explores how changes in the way land is used can mitigate greenhouse gas (GHG) emissions. While it focuses on cost-effective land-use responses that could be implemented by landowners, it does not recommend who should bear the costs of those changes. The report presents scenarios developed by the Biological Emissions Reference Group with input from Motu’s modelling team. The main project objective is to predict the likely extent and nature of land-use change as part of a cost-effective response to land-sector mitigation targets and the potential economic, and social impacts of these changes. The report explores how land-use changes, and the intensity of effort required to achieve them, vary with the timing and stringency of targets and with different assumptions about new land uses and technology. Also examined are the national impacts on gross domestic product (GDP), production of key export commodities, and employment. "Dr Duncan Steel is a scientist at the Centre for Space Science Technology (CSST) and he knows a thing or two about the Universe. He has even had an asteroid named after him. Steel is currently working on looking at how we can exploit satellite imagery for the good of New Zealand companies. And CSST CEO Steve Cotter reckons this is where New Zealand can really have an impact." Read about the work by the Centre for Space Science Technology on Radio NZ. Cawthron Institute Freshwater Ecologist Joanne Clapcott was the coauthor of a recently-published research article in Science Advances on the effect of climatic factors on river-based ecosystems. Science Advances is an open access journal from AAAS - The American Association for the Advancement of Science, that publishes innovative original research across all disciplines of science freely and globally. Joanne was one of 153 researchers from 40 countries that worked on the project. The Regional Science and Innovation Centre (RSIC). Here the steel construction allows a structure with open spaces and free circulation. The main seismic resisting elements are the Buckling Restrained Braces (BRB) manufactured by HERA members D&H Steel under license from Star Seismic. The team at HERA have developed a new procedure to select steel grades manufactured to Australian and New Zealand standards in collaboration with the University of Wilhelmshaven and the University of Sydney. To ensure the safety of steel structures, design engineers need to select steel grades that will remain ductile under the imposed conditions that include in-service loadings, fabrication-induced conditions, seismic actions, and service temperatures. Following a $7.1 million pledge from the Hugh Green Foundation a world-class biomedical research technology hub is to be built at the Malaghan Institute of Medical Research, marking a new era of science discovery in New Zealand. The Hugh Green Cytometry Centre, to be led by Head of Research Technology Kylie Price, will underpin the Malaghan Institute’s immunology research across cancer, asthma and allergy, gut health, brain health, and infectious diseases. The centre will also support a range of New Zealand science organisations in biochemistry, molecular biology, chemistry, neuroscience, and marine biology. Head of Research Technology at the Malaghan Institute of Medical Research, Kylie Price. Photo: Malaghan Institute. Kūtaicam, a data-capturing buoy deployed as part of the Open Ocean Aquaculture Programme. Image: Cawthron Institute. Cawthron Institute and Whakatōhea Mussels Ltd are providing boaties with the key information they need to plan their summer trips in the Eastern Bay of Plenty region using “Kūtaicam”, a data-capturing buoy deployed as part of the Open Ocean Aquaculture Programme. Cawthron Institute deployed the buoy at the Whakatōhea Mussels Ltd’s farm 8km off the coast from Ōpōtiki and is now publicly sharing some of the data it captures on weather conditions - including wind direction and strength, wave heights, and water temperature. Cutting-edge technology, developed by Lincoln Agritech Ltd and commercialised by CertusBio, aimed at minimising waste in the food processing industry has received major recognition at Australia’s largest agricultural technology event. CertusBio CEO Dr Matthew Jones took home the top cash prize of $20,000 in the Investment Ready Pitch Tent competition of the inaugural EvokeAg event held in February in Melbourne. The Christchurch-based innovator was one of five finalists. Dr Jones’ winning concept is an automated technology which reduces industrial food processing waste by 40 per cent. It includes a biosensor device that provides real-time insights into when food is wasted. With 2-3 per cent of all processed milk disappearing down the drain, the dairy industry loses around NZ$12.8 billion per year globally to wastage. “CertusBio is transforming industrial food production to prevent this type of waste,” says Matthew. Dr Matthew Jones, CertusBio CEO, wins the AgriFutures EvokeAg Investment Ready Pitch Tent prize in Melbourne. Image: Lincoln Agritech. BRANZ are collaborating with multiple Research Organisations and government agencies on the 2018 General Social Survey (GSS) to provide new important data on the quality of New Zealand housing. The last house condition survey in 2016 saw BRANZ research provide evidence to support Residential Tenancies Act (RTA) changes that are expected to lead to 180,000 properties being insulated by this year. Trained surveyors undertake a comprehensive assessment of the physical properties of houses in the survey, recording details on materials, systems and services present, energy efficiency (insulation and heating), signs of damp and mould, the condition of individual components and an overall assessment of state of repair. Image: BRANZ. IRANZ has gone social. For up-to-date information about the activities of our member organisations and same-day notification of updates to the website follow us on the link below. IRANZ is an association of independent research organisations. Its members undertake scientific research, development or technology transfer. Members include Aqualinc Research Ltd, BRANZ, Cawthron Institute, CRL Energy Ltd, Centre for Space Science Technology (CSST), Heavy Engineering Research Association (HERA), Leather & Shoe Research Association (LASRA), Lincoln Agritech Ltd, Mackie Research, Malaghan Institute of Medical Research, Medical Research Institute of New Zealand (MRINZ), Motu Economic and Public Policy Research, New Zealand Institute of Minerals to Materials Research, PlantTech Research Institute, Titanium Industry Development Association Ltd (TiDA Ltd), Transport Engineering Research NZ Ltd (TERNZ), and WSP Opus Research.